Seems like, magic of robert’s performance in twilight has also inspired major companies like Pepsi. 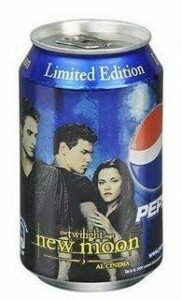 Before, his Twilight poster was printed on a perfume bottle and now he is going to appear on Pepsi cans. Isn’t it amazing? A man in a young age, is getting skyhigh populairty. Robert Pattinson is considered to be one of the best actors in Hollywood and film industry, whhich is a great honor for a young person. His fans are romaing around him like honeybees are possessive about their behives. Without any doubt, Robert Pattinson is good enough to grab the attention of not only his audience but also he has influenced many major companies like Pepsi. Limited editions are available in the market onto which Twilight poster attracts the attention superbly. I am crazy fan of Edward-Robertzzz and looking for my can. Are you?